Hockey fans are still buzzing about the early November matchup between the Blue Jackets and Canadiens. Did I say "buzzing about?" I meant laughing about. And occasionally high-fiving about. And maybe also getting tattoos in commemoration of. Look, I won't tell you how to live your life. But as much fun as the hockey world is having with the Canadiens in the wake of their 10-0 loss, it's worth pointing out that it's not unheard of for an NHL team to lose a game by double digits. While that game was the first since 2003, the Canadiens actually became the 74th team in league history to lose a game by 10 or more. Let's take a look back at some of the other teams that have pulled it off. We might as well start with the single worst loss in NHL history. The 1943-44 Rangers were quite possibly the worst team the NHL has ever seen. They suffered through the worst start of all-time, going 15 games before they earned their first win. They didn’t win their sixth game until Jan. 22, and that turned out to be their last victory of the season, as they closed with a 21-game winless streak. They gave up double-digit goals seven times. And on Jan. 23, 1944, the Rangers visited the Red Wings and turned in what still stands as the worst performance in NHL history. The Wings scored two in the first, five in the second, and then poured it on with eight more in the third for a total of 15 goals on the night. (A 16th goal was waved off because it went in a fraction of a second after the final siren.) The Rangers managed only nine shots, none of which found the back of the net. 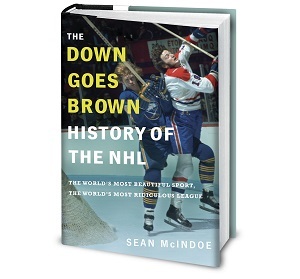 The 15-0 final still stands as the biggest blowout in NHL history. And in today's low-scoring league, we can probably go ahead and say that the record will never be broken. Double-digit losses don’t only happen to bad teams. Even the best teams can fall victim to an awful night. And that includes teams that are just a few months away from winning the Stanley Cup. The 1983-84 Oilers could even make a case as one of the best teams ever. They racked up 119 points, finishing tops in the league by a mile. They scored 446 goals, averaging more than a goal-per-game more than the next highest scoring team. They had three 50-goal scorers and four 100-point players, including Wayne Gretzky winning his fifth-straight Hart trophy with 87 goals and 205 points. And on Feb. 12, they got destroyed by, of all teams, the Hartford Whalers. The Whalers weren't even very good, winning 28 games and missing the playoffs. But that night, they ran up the score on the mighty Oilers on their way to an 11-0 win. Ron Francis had four goals and Greg Malone had three. Hartford's Greg Millen posted the shutout, while Edmonton's Grant Fuhr and Andy Moog emphatically did not. The game capped off a five-game losing streak for Edmonton, one that also included a 9-2 loss to the Capitals. It was apparently a wakeup call: they immediately kicked off an eight-game winning streak. They went on to win that year's Stanley Cup, losing only four playoff games in the process and launching the sport's last great dynasty.